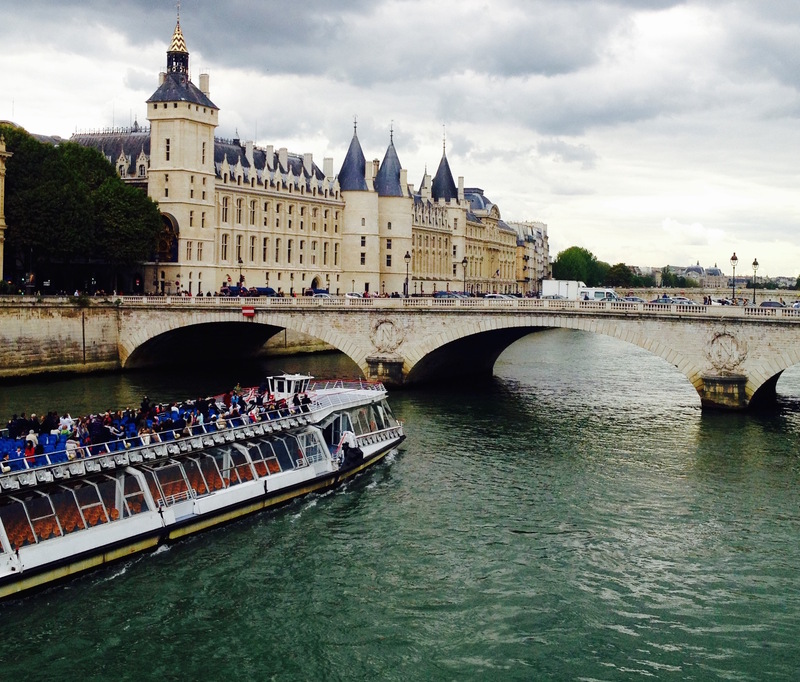 source url Nine years ago, while studying in Paris, I made a group of Parisian friends who became my passport to a travel experience far beyond the landscape of France. follow Many of the young men in the group came from the “Dix-neuvième”, the 19th Arrondisement of Paris, home to the majority of the city’s North African immigrants. Some of the guys — with musical names like Walid, Ouissem, Mouldi, Anis and Sami — were born in France to parents from Tunisia. http://edgplancollection.com/?x=viagra-interaction-with-other-drugs I was 22 years old when I met them. Embarrassingly, I wasn’t even sure I’d ever heard of the country before, let alone contemplated going there. trilipix similar drugs to viagra Eventually, however, I learned about Tunisia: that its cuisine sounded delicious — savory lamb dishes, coucous, roasted peppers and lots of spices; that it boasted a temperate climate, with hot summers that baked its crystalline Mediterranean beaches; and that it is a Muslim country that grants women rights not always found in Arab regions, like education and the choice of whether or not to veil themselves. generic viagra canadian viagra in uk So, when I received an invitation to join some of these friends in Tunisia, I didn’t hesitate. follow url Our trip included three days in Kerkennah, a necklace of low-lying islands off the east coast of the country, in the Gulf of Gabes. A group of 13, we stayed at the vacation home of one of my friend’s parents. This friend’s name is Walid. The couples slept in the guest rooms; the singles, myself included, bunked on mattresses sprawled across the den floor. http://oldafricamagazine.com/?search=overnight-delivery-viagra In the mornings, we woke to breakfast made by Walid’s mother. Circled around the outdoor table, we hungrily slathered Nutella on perfectly round crepes; inhaled juicy, Tunisian peaches; and sipped wickedly strong cups of espresso. enter site Both of Walid’s parents were born on this island, which is covered mostly by vast tracts of desert and palm trees. 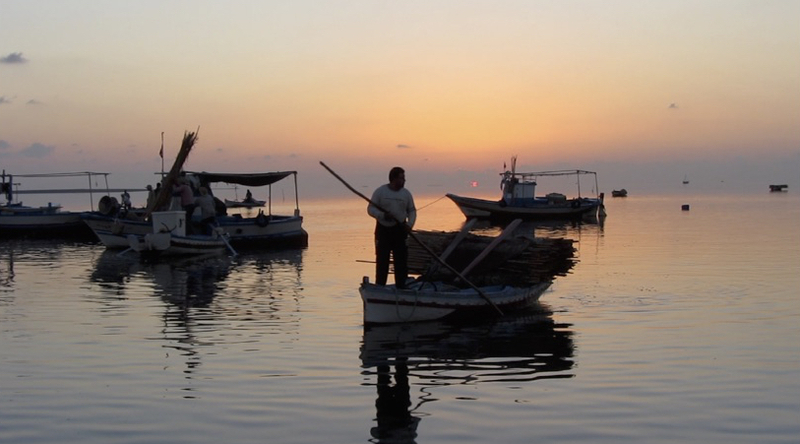 Although they had emigrated from Tunisia for a life in Paris, nearly all of their relatives still live on the island, maintaining the old family business as fishermen. go site On our second morning, we woke before dawn to meet Walid’s uncles and their crew for a day of fishing. When we arrived at the seashore, the fishermen were already abuzz, untying their boats; transferring buckets of ice to preserve the day’s catch; and stowing food for later in their journey. There was tension in the air. It was late, already — 5:45 AM — and we were supposed to have left at 5:30. Walid’s uncles, Bachir and Adel, barked orders at the crew in Arabic. Naturally, I didn’t understand what they were saying, but I guessed from their gestures that they were worried there were too many of us. Normally, only nine fishermen went out on this boat. But today we would be 24, including a toddler. The old fishing boat was painted light blue, a color commonly used throughout Tunisia on the exterior doors and shutters of the villages’ whitewashed homes. A tattered Tunisian flag, red and white, sagged from a rod tethered over the engine room. And the sky was drenched in orange and pink from the rising sunlight. As we pulled away, three rowboats were towed behind us, crammed with crewmembers, young and old. They gazed up at us with those intense Tunisian eyes; their clothes and skin were weatherworn; and when they spoke to each other, their Arabic came out rough and curt. One very tan man — who instantly conjured images in my mind of Giancarlo Gianni, the lead actor in the original Swept Away — washed down the boat with a bucket of soapy water. Others used pocketknives to file the rough edges off long bamboo sticks, which would be used later for fishing. Finally, Walid’s 19-year-old cousin, Houcem, steered us out to sea, in the direction of the sun. While the crew busied themselves, we — a cheerful gaggle of Parisians, a Brit and an American — lazed on deck eating chocolate cookies, cake and grapes for breakfast. I couldn’t tell if the crew viewed us as spoiled interlopers, or if they just didn’t know how to interact with us, as we didn’t know how to act with them. But over the course of the day, we earned our keep. The men from our group spent hours wading in the shallow, salty waters, scavenging fish after fish from the nets alongside the real fishermen; and we girls unthinkingly provided a little visual excitement, none of us culturally sensitive enough not to strip down to our bikinis as we lounged about the boat. But it soon became apparent that lounging was all we women were expected to do that day. I shouldn’t have assumed to participate in the man’s job of fishing. So we sunbathed on the boat while the men ventured out, time and again, on rowboats, setting up nets in mysterious circular patterns; and then returning with buckets full of mullet fish. The only man who stayed behind with us was Giancarlo (whose real name was Rashid). He didn’t communicate much with us because of his limited French, but we soon realized he was assigned the role of our caretaker for the day. He was, at first, unsmiling and distant. But his veneer eventually cracked when it came time for a smoke break at 7: 30am. He offered us cigarettes. Later, when the sun got too strong, he pulled a tarp over the galley so that we wouldn’t burn. And when we jumped off the boat for a swim, he was there to lift us back on board, one by one. global drugs direct viagra sales Even though few words passed among us, there were grateful glances and nods. Finally, after the sun had moved from the eastern sky to directly overhead, our patience paid off. It was the last catch of the day and we women were invited to fish. Giancarlo rowed us out to where the rest of the fishermen were already setting up the next catch. Their fishing technique, honed over generations, was like nothing I’d seen before. The system involves two nets. One forms a vertical wall from the surface of the water to the seafloor. 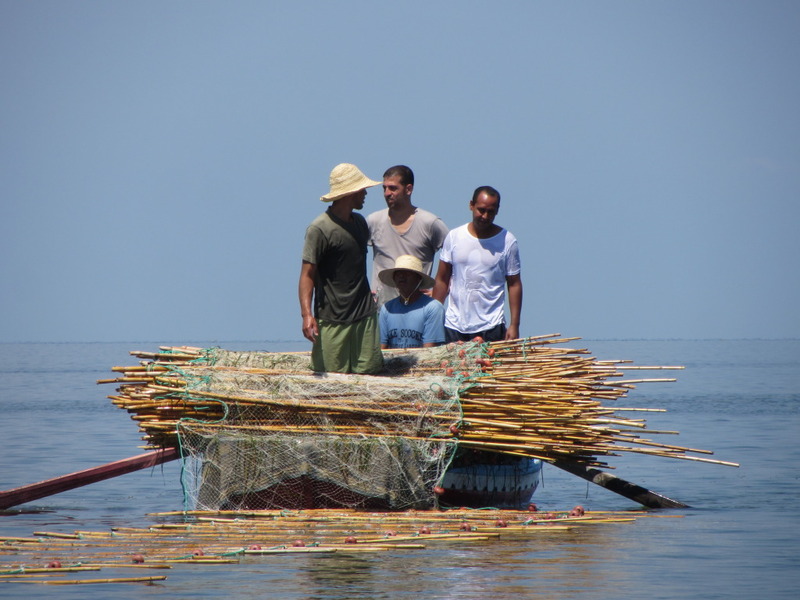 This net is then fashioned into a cylindrical cage, trapping fish inside. A second net is then laid down horizontally outside the circle’s perimeter, buoyed by those bamboo sticks, which were now woven into the mesh, forming a four-foot-wide trap. When the fish realize they are caged in, they jump out of the water and over the vertical net, only to get caught in the horizontal one. It was a fascinating process to witness. As the girls and I arrived on the scene, Giancarlo showed us how to beat the water with a big stick to herd the fish in the direction of the nets before the circle was closed. Only moments later, fish started shooting out of the water and into the horizontal net. That’s when I found my chance to get into the action. Accompanied by the fishermen, we trudged through the water along the horizontal net, threading out every fish we could find. They were slimy and soft, with little prickly spikes for fins. 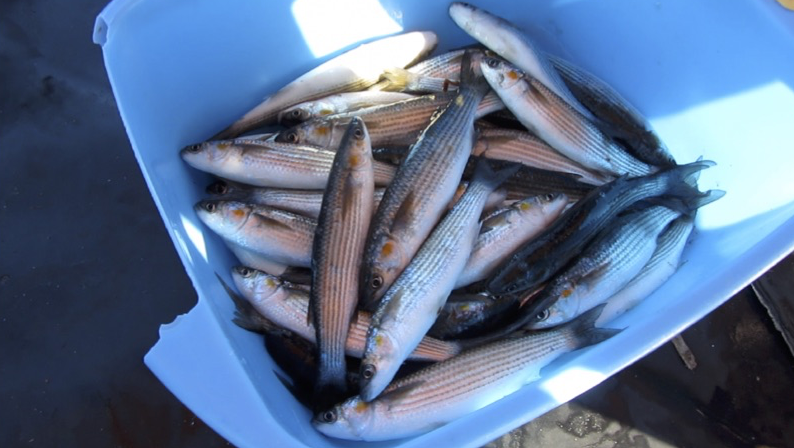 As the slender, grey bodies of the mullet fish flopped around in the tangle of mesh, their fins pricked my fingers. Once I got my first fish untangled, I was instructed to hold it by the head so that it could not wriggle out of my hand to freedom. Next, I had to perfect my lob, tossing the fish into the basket, which was nestled out of sight in the hull of one of the rowboats. go site 1, 2, 4, 6… 10. I proudly caught 15 fish! The experience was exhilarating. l felt as if I’d been admitted to a secret club, one in which only rugged and tough men were allowed. And yet there I was, participating like one of the boys. And still in my bikini. 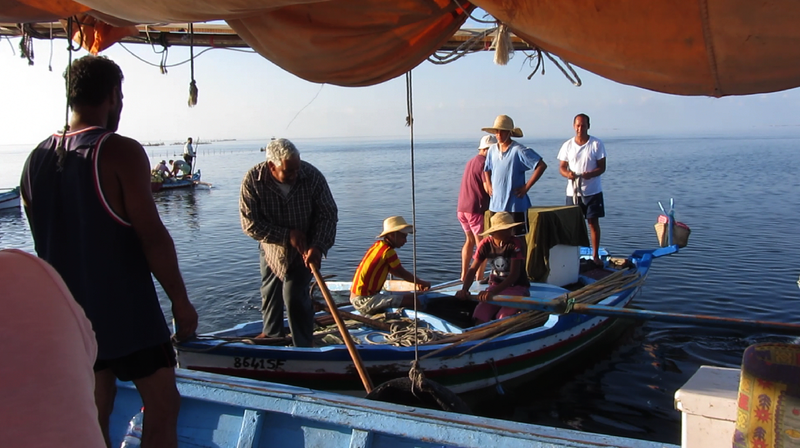 After the net was empty, Giancarlo gave me a lift onto to the rowboat, and paddled us back to the main vessel, where we discovered that the deck had been transformed into a kitchen, bustling with action. Walid’s uncles had prepared a feast over a portable coal-burning stove. There was spicy tomato sauce infused with cumin and onions; flame roasted mullets, caught just moments before; Tunisian baguettes to soak it all up; and freshly cut melon for dessert. As we stuffed our cheeks full, I couldn’t help but to think about how differently I felt about these men now. In the morning, they seemed brutish and foreign — as if we had no common ground. But now they seemed like friends who had graciously included us in their daily ritual, permitting us into their world the best they knew how. I asked one of Walid’s uncles why he liked to fish. “Pour la liberté” (for the freedom), he said. I asked another the same question. He said it was because he likes it. Hearing his answer, one of the crew members snorted, “No, it is because you never went to school.” All of the guys laughed in response. The world in which I became engaged that day is so distant from my own. And though the labor of it all is strenuous, day after day, there is a beautiful simplicity to their work that I couldn’t help but envy. I can only imagine the nostalgia Walid feels whenever he returns to this place from his busy Parisian life as a civil engineer. Here he reconnects with his uncles — and his heritage — as they all set out to sea in search of their daily catch.